These are cheap and delicious. 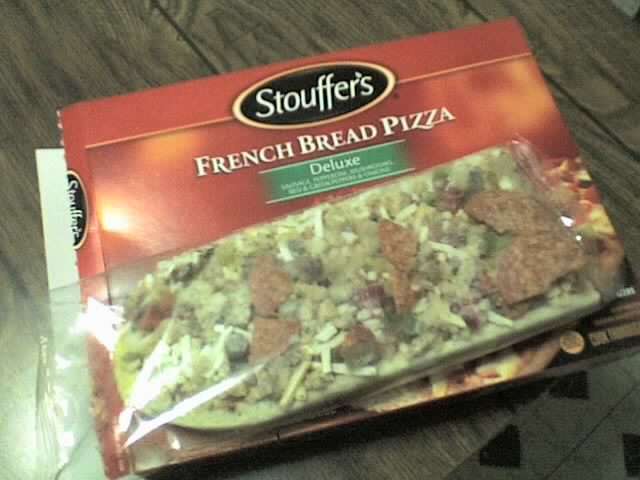 While making a Mama Celeste feels like you’re in college using the crusty toaster oven your roommate fucked up with a batch of exploded pizza rolls, making a Stouffer’s French Bread Pizza feels positively gourmet. After all, it’s on French bread. Since I was old enough to use an oven, these were among the first food items I was allowed to cook. Today, they count among the only food items I know how to cook. They have always reminded me of boats, boats filled with frozen pizza toppings. Mini-toppings, tiny replicas of the real thing. One thing I learned early on is not to try and be fancy by adding additional toppings. The delicate eco-balance of the French Bread Pizza is thrown off by adding some extra cheese on top. The entire thing refuses to cook if even a microgram of an ounce in weight is added. Save your flourishes for your Bobolis. Happy Thanksgiving from THE [GOBBLING] PIZZA. See you tomorrow, on Black Friday, when XMAS WITH THE PIZZA begins.